Pixel Dust Photo Art: Hosting a New Photo Challenge! I have decided to host a photography challenge here at Pixel Dust Photo Art, every Friday (to the following Monday) beginning September 9th, 2011. 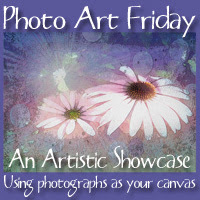 It will be called Photo Art Friday and will be a showcase of photographs that look like a piece of art. I am SO hoping you will participate! You are producing beautiful artistic images all the time, so you do not have to do anything new or different to participate here. Simply share some of your most artistic images - be they SOOC (straight out of camera) or digitally edited - an 'artsy' image that you might want to frame and hang on your wall. A piece of photo art could be anything from a portrait, landscape, still life, abstract, grunge, vintage, mosaic, etc., etc., etc., image that was created from a photograph. It would not be a photograph of one of your paintings or mixed-media artworks. We want art created using your photographs as your canvas. The link-up post for Photo Art Friday will be published a little before each Friday - every Thursday at 7:00 p.m. EST - so the first opportunity to link up an image would be Thursday, September 8th, at 7:00 p.m. EST. You will be able to link any time after that until the following Monday - every week. So check out the simple guidelines by clicking the Photo Art Friday static page (under my header) and begin to think about a piece of photo art that you would like to feature here. Easy peasy. What a fab idea, Bonnie! I've been playing around with textures and having way too much fun. So addicting (like I don't have enough addictions already. Sheesh). Hooray for Photo Art Fridays!! That sounds like a lot of fun. I can't wait to participate and see what everyone else comes up with...so much inspiration. I like your idea of building a new community, and the welcome mat you're putting out for everyone of all levels to share their happy discoveries, experiments, treasured pieces. Great idea! And I definitely will need a reminder! Ha! How interesting, I'm looking forward to the September 9 to participate. I hope we remember it again nearer the date. Sounds great! I can't wait to see everyone's artwork.